Route 66, known also as the Mother Road, was one of the original highways of the U.S. Highway System. Nowadays that doesn't seem like a big deal, but back then, it was historic. There were songs and a whole TV show dedicated to it. So, what better way to pick a name for your baby? One day you can tell them your inspiration, the history behind it and better yet, take your child on a Route 66 road trip! 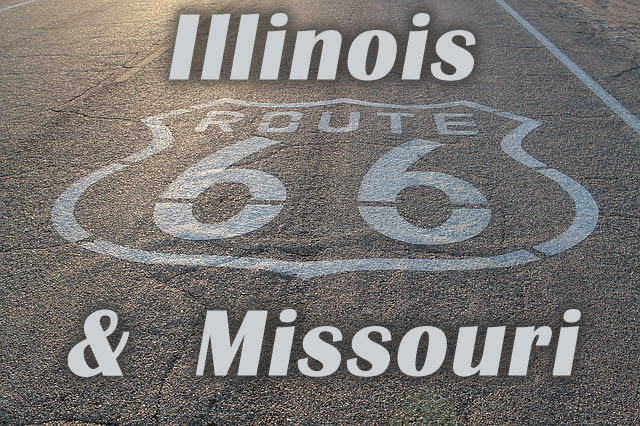 We're going to start with some city names in Illinois and work our way west! Dwight This is an old school name that could be poised for a comeback. It means 'fair one' and has a distinguished sound. It also has the benefit of a great nickname, Ike, made famous by late US President Dwight "Ike" Eisenhower, and his campaign slogan, "I like Ike". He is after all the one who championed and signed the bill that authorized the Interstate Highway System. So, this is a powerful name for your boy to live up! Odell Generally a boy's name but has been used for some girls. Depending on the country of origin the name can hold different meanings, but among them is 'Wealthy' and who doesn't want that? It's got a sophisticated sound, paired with the right middle name your baby boy could sound like royalty. Madison Originally a boy's name, meaning "son of Maud" Madison is now commonly known as a girl's name as well. It's also attributed to the meaning 'child of a mighty warrior.' Both of them source from Maud, which means 'might in battle,' so either way you look at it, this is a strong name. Madison Illinois along Route 66 hosts the Chain of Rocks Bridge, which has a very unique 30 degree turn midway across the river. This would be a great thing to show little Madison when they are a bit older. Fenton A boys name meaning 'from the marsh,' is another old fashioned name quickly coming back in style. The name and the meaning give the impression of someone coming from humble roots, a man that can as they say, pull himself up from his bootstraps. The Fenton city borders barely touch Route 66, but it does house a wonderful piece of Americana kitsch, the Pink Elephant. Gray (Gray Summit) A wonderful gender neutral name with style. Its meaning is so plain and obvious, that it stands out as unusual. And "gray" in general has come to mean so much more than it does. Gray has so much potential, it represents the in between, not quite black and not quite white, but full of possibility. Someone name Gray can read between the lines and think outside of the box. Sullivan An Irish boy's name that means 'little dark eyes' Sullivan sounds like a guy you want to hang out with. The town of Sullivan still has some Route 66 landmarks you can see, even if they aren't all operational. The name itself is a great choice, particular if you have Irish blood in you, but even if you don't. Rosati This name comes from the Italian settlers of the area. The word is a patronymic of Rosato, which means 'pink' or 'rose colored.' What a pretty name for a little girl! The city is in the Ozark foothills, and the predominant industry, started by the Italians, is wine. The Rosati Winery includes a museum and gift shop, and is a great place to celebrate your Rosati's 21st birthday. Jerome This boy's name means 'sacred name.' It represents someone who would be morally and spiritually just. The name is usually homage to Saint Jerome who translated the Bible into Latin. Route 66 runs along the fringes of the town in an unpopulated area, but if you go off course a bit you can take Jerome to see some great Route 66 landmarks. Clementine This is a beautiful name that means 'merciful.' There are also of course the delicious oranges called Clementine. All around this name brings to mind a sweet and kind girl that everyone would love to know. It is said the first time this name was documented was for a Belgium princess! Sampson Also spelled Samson, this is biblical name which means 'sun.' So, Sampson is a guy who will light up your life. Like many towns along old Route 66, Sampson is a ghost town, but those can be interesting to drive through and visit. Your little Sampson could travel the road and shed his light on all these old places. Thanks for reading the baby name tour through the first two states of Route 66, next up will be Kansas and Oklahoma!